Earn $2.42 in VIP credit. Click to Learn More. The Vittoria Terreno Wet Gravel Tire is designed to be the ultimate wet weather weapon, providing a performance advantage when the trail turns to muck. This wet-weather optimized tread pattern features an alternating center ridge, delivering an extremely fast rolling tire that offers ample traction for cornering and braking. Generous cleaning channels guide mud, moisture, and debris away from the traction patch for optimal traction. 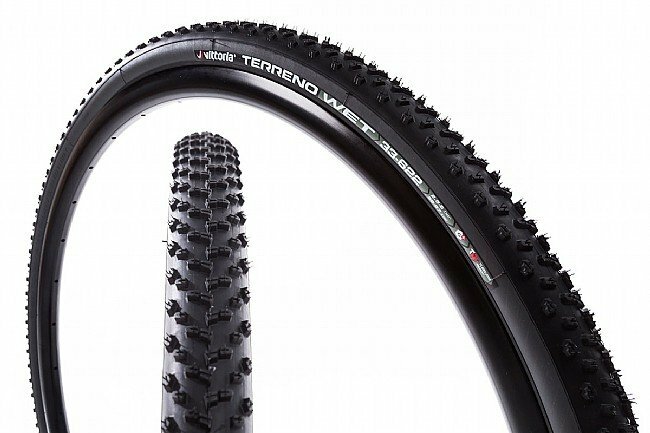 Available in three variants, each tire in the Terreno lineup is constructed from the Vittoria 3C rubber compound, blending three separate compounds to provide the Featuring Vittoria's Graphene technology, these tires provide a faster rolling more durable tire that isn't phased by wet weather. Each of the three variants uses Vittoria's TNT 120 TPI gravel tire casing, providing sidewall puncture protection and tubeless compatibility.